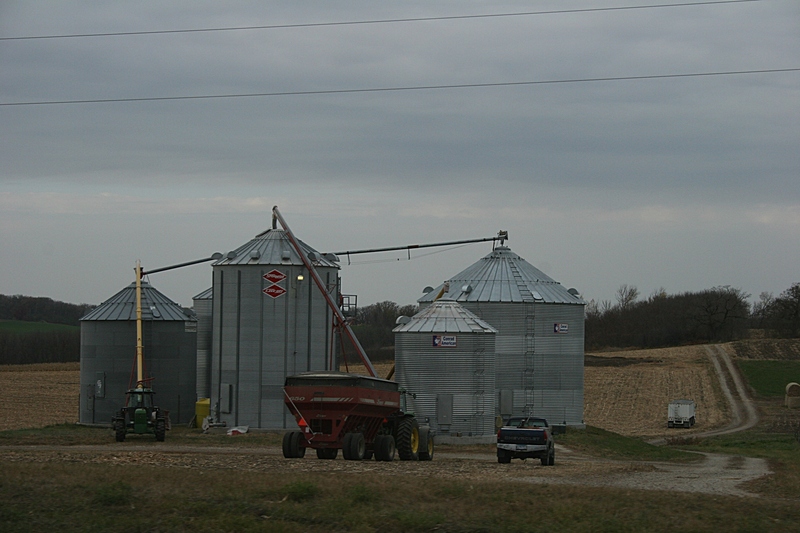 A harvest scene along U.S. Highway 52 in southeastern Minnesota Sunday afternoon. YOU CAN TAKE the girl off the farm, but you can’t take the farm out of the girl. Even decades after leaving my childhood farm at age 17 to start my freshman year of college in the fall of 1974, I hold tight to my agricultural roots. My rural upbringing shaped me as a person, defined me as a writer and photographer. More often than not, I find myself creatively focused on the rural, on those places and memories that remind me of the farm and which hold the strongest grasp on my heart. So I am naturally drawn to photographing rural landscapes and barns and country churches and tractors and small towns whenever I travel. These are the places and objects to which I feel the deepest connection. 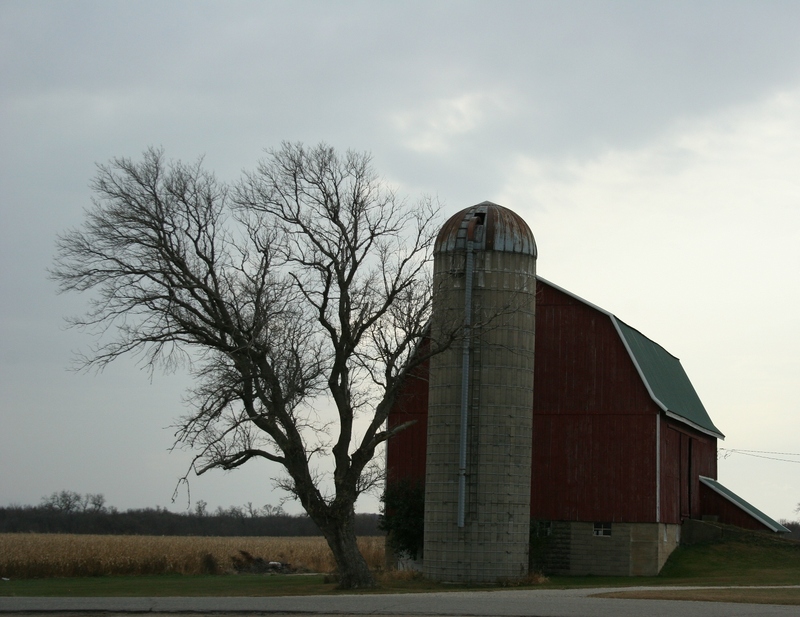 I'm always and forever photographing barns like this one along Hwy 52 between Pine Island and Rochester. 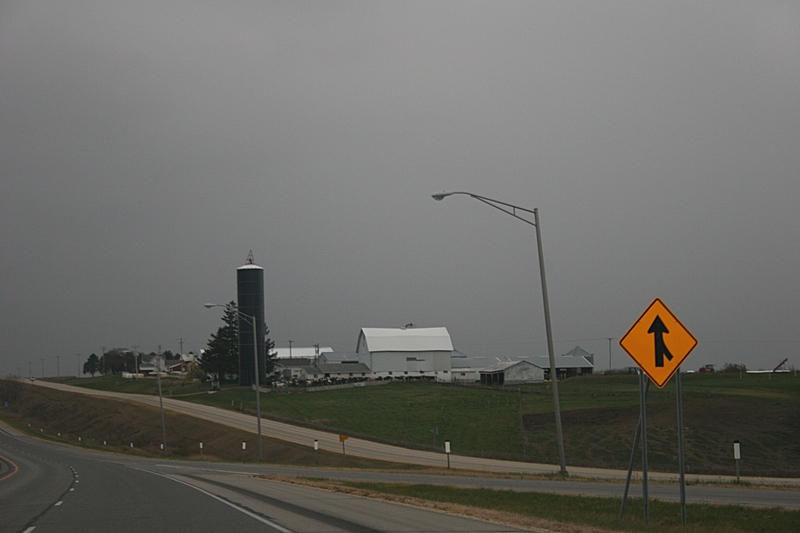 Today I’ll take you along U.S. Highway 52 and Interstate 90 in the southeastern section of Minnesota. I’ll show you rural snippets photographed at highway speeds through the passenger side and front windows of our family’s cars. Yes, cars, plural. 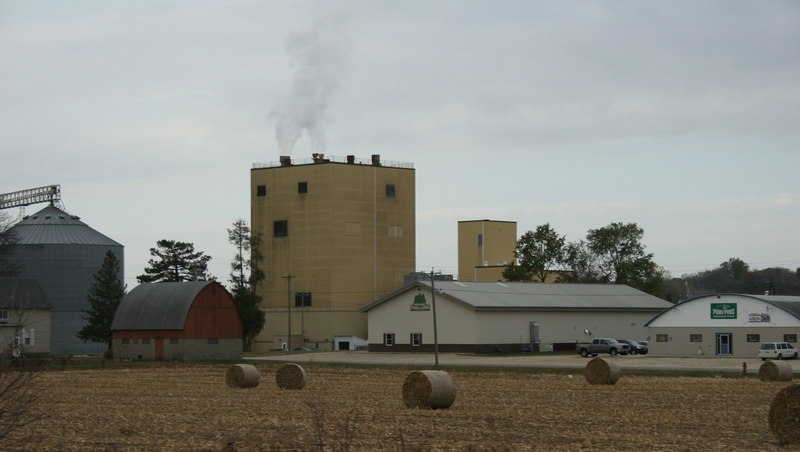 My husband and I made a quick jaunt to Tomah, Wisconsin, on Sunday to exchange vehicles with our second daughter. Hers needs repair and we met her half-way between her home and ours. After 2 ½ hours of travel to reach Tomah, we lunched with Miranda and a friend before turning around and heading back home to Faribault. The day rated as gloomy and dreary weather-wise. Yet, as you will see, such moody skies bring out an emotion in images that you might not feel had the day been sunny bright. I’m always surprised, when I view the photos, to see the details I missed in the process of shooting the images. But then, along-the-highway scenes flash by in an instant and they are gone, not wholly appreciated until that second, later look in a photo. You can barely see the distant tractor in this shot. 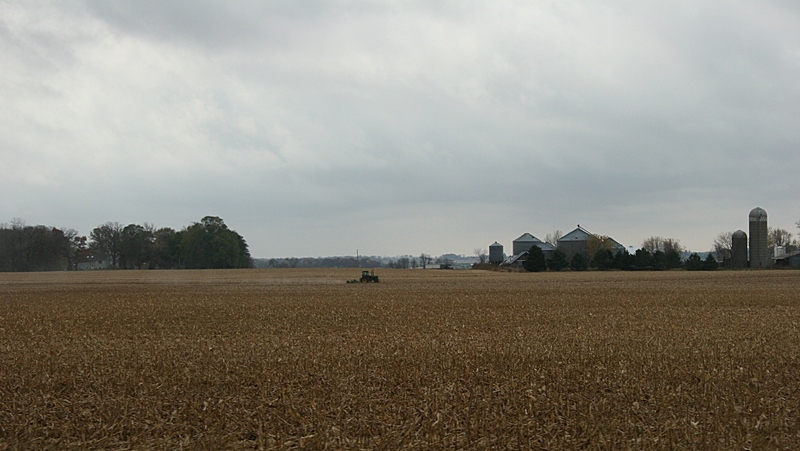 But that's what I like about this scene, how the sheer size of the cornfield and the skies dwarf the tractor, reinforcing the thought that everything is truly small in comparison to the landscape, to the big, big world. Every red building stood out against the grey, grey skies. Sky is always an integral part of my photos. 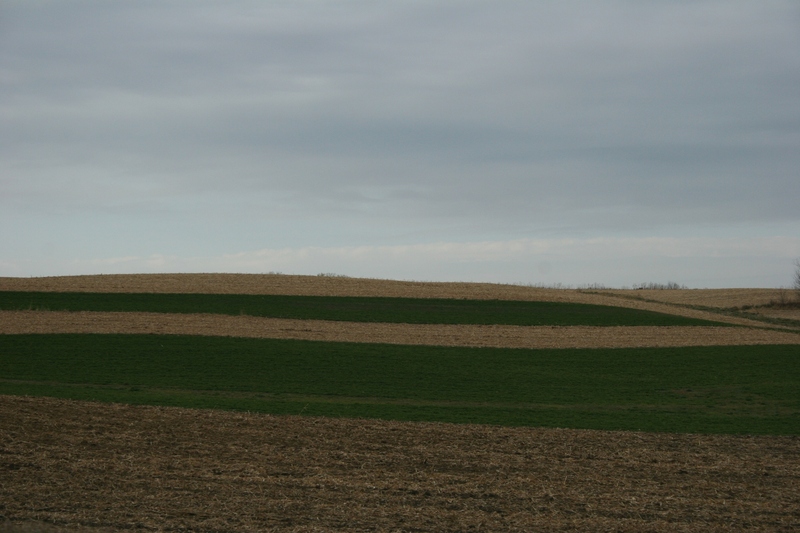 Even the stripes of crops are aesthetically pleasing to my photographer's eye. This photo of Pine Island connects town and country in a seamless blend. 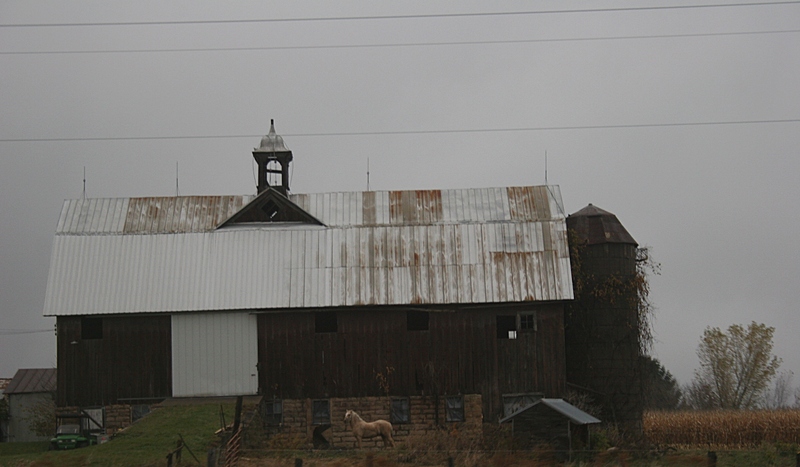 An historic barn and a horse...a common sight along Hwy 52 and I-90. 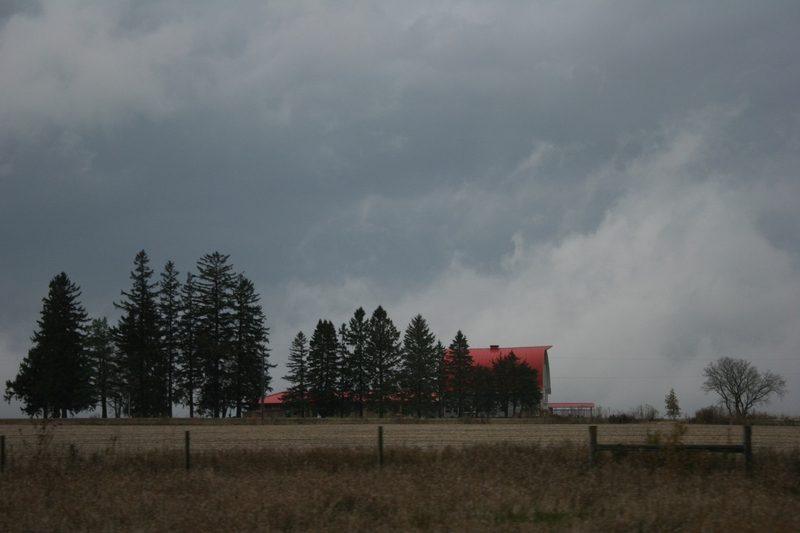 The red-roofed barn provides a jolt of color under heavy grey skies. 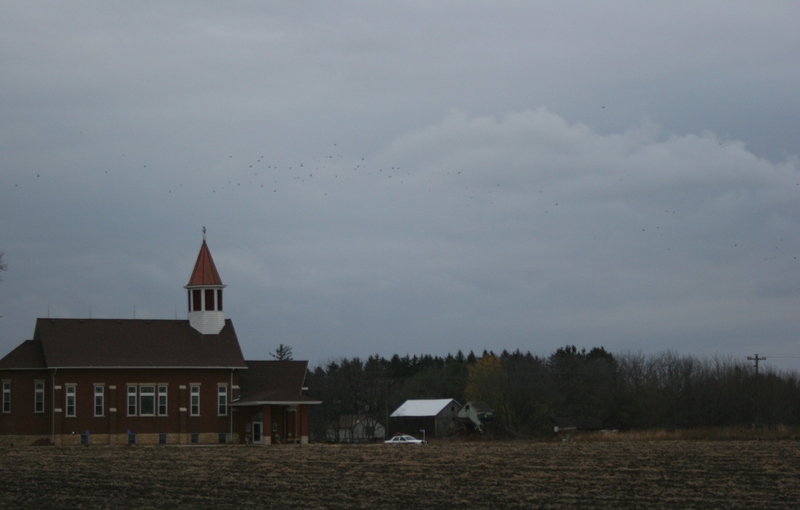 A country church, strong and sturdy, along I-90 near the Winona exit. Look closely and you'll see a sheriff's department squad car parked by the church. Westbound on I-90, the sun begins to set. I like the contrast between the vivid yellow sign and the grey of the day. Yes, they are. 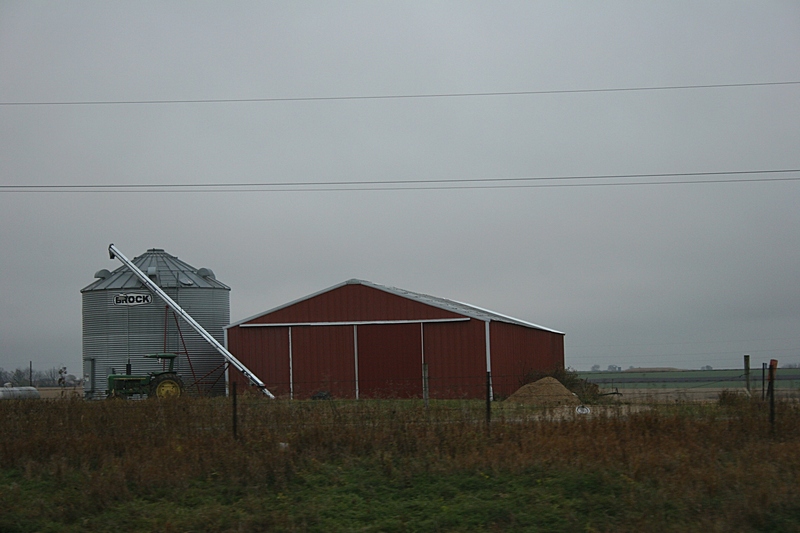 I see the same serene qualities in the rural photos on your blog. Yes – born & raised country, and I go back every chance I get! Great photos. Thank you. I don’t get back often enough to my native prairie in southwestern Minnesota. But I sure appreciate the rural areas here in southeastern Minnesota.